The Cape Floristic Region is found in the Western Cape of South Africa and is famed for its high plant species richness (8 700 species) and its high endemicity, and in recent times it isn’t surprising that the Cape Floral Region has coined the phrase ‘the world’s hottest hotspot of biological diversity’. Amazingly, 70% of Cape floral species are found here and nowhere else on the planet, surpassing many tropical forest regions in floral diversity and richness. The Cape Floral Region is located at the southwestern corner of Africa, and is an L-shaped area averaging only 100 km in width. It extends about 500 km along the south coast of South Africa from Cape Town to Port Elizabeth, and an additional 250 km northward from Cape Town to the semi-arid Namaqualand. This region experiences a very wet and cold winter followed by a dry summer period, which can lead to drought. To date, 241 native orchid species belonging to the Cape flora are recognised (with many more likely to be discovered). This is an unusually high number of species for a temperate region, considering the relatively small size of the area. These orchid species have not just merely eked out an existence in this region, but have thrived due to the unusual strategies they have evolved for survival in this harsh environment of ecological extremes. Of the 24 genera occurring in the Cape Floral Region, only 5 genera (8 species) are epiphytic with the majority being terrestrial (19 genera comprising of 233 species). The most well-known and rich genera is that of Disa which has 104 recognised species. Of the Disa genera the most famous species is that of Disa uniflora, an iconic red flower referred to as the Pride of Table Mountain. Its range is restricted to Sandstone Mountains, from the west of Hermanus to Table Mountain and northwards into the Cederberg. Disa uniflora thrives in seeps, waterfalls and streamlets in the mountains and has one of the most complex orchid pollination systems known, and is facilitated by the Mountain Pride Butterfly (Aeropetes tulbagia). 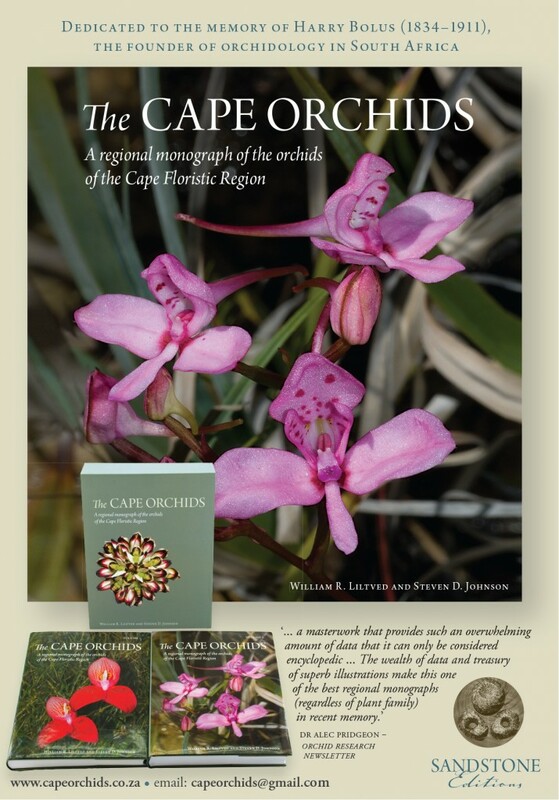 For those interested in learning more about the Cape Orchids, the COS has partnered with author Bill Liltved to offer ‘The Cape Orchids’ A regional monograph of the orchids of the Cape Floristic Region. The COS is retailing these books at R3500. See contact details should you be interested in supporting this fantastic monograph! To join the Cape Orchid Society simply download and complete our Application Form and bring it with you to one of our monthly meetings or email your completed form to president@capeorchidsociety.co.za. Meetings: The Cape Orchid Society meets every fourth Tuesday evening of the month from 7pm at the Athenaeum, 1 Mariendahl Lane (off Campground Road) in Newlands, Cape Town.